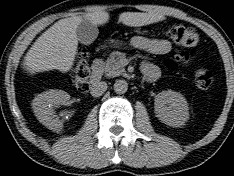 The following course is intended to help participant nuances of CT scan parameters, protocol building and radiation dose optimization especially for evaluation of renal colic. This course was created at Massachusetts General Hospital in partnership with Yale Medical School. This course was made possible with support from Agency for Healthcare Research and Quality (AHRQ) grant (1R18HS023778-01; PI: Moore, Christopher L; Title: Minimizing Unnecessary Irradiation from Renal Colic CT Scans in the United States). We would like to acknowledge help from Garry Choy, MD, MBA and Swati Goyal from MGH – without their help and support, this course would not have been possible. In addition, we are also grateful to Melissa Shaw for her help and support in creation of the course.